Two first half goals from Caolan Lavery and Sam Hird plus a 63rd minute strike from Sam Morsy were enough for Chesterfield to end their four match losing streak against ten man Fleetwood who lost Antoni Sarcevic as well as seeing manager Graham Alexander invited to watch part of the match from the stands. Paul Cook’s side came out on top in the two legged Johnstone’s Paint Trophy Northern Final to earn a trip to Wembley whilst on the final day of the season, Gary Roberts grabbed the come from behind winner that clinched the League Two title. A win for Chesterfield this afternoon would be celebrated with almost as much glee as on those two occasions as Spireites attempt to get their points total moving again after being stuck on 42 for the last four games. A home win would see Spireites, starting the day in 10th spot, leapfrog Graham Alexander’s Cod Army who sit two points and two places in front. Manager Cook makes three personnel changes and a formation change following the single goal loss at Rochdale. Moving from 4-3-3 to his favoured 4-2-3-1, the boss has brought back skipper Ian Evatt after concussion, left-back Dan Jones returns after illness whilst striker Caolan Lavery ploughs the lone furrow up top. They replace Ashley Carter, Gboly Ariyibi and Armand Gnanduillet. Fleetwood give a debut to on loan from Brighton left-back Adam Chicksen, signed to cover for the suspended Stephen Crainey, who picked up two yellow cards in the win over Notts County last weekend. Sam Morsy retained the skipper’s armband despite Evatt’s return. Darikwa blocked a shot from Chicksen and Lee had to dive left to paw away a downward Haughton header as the Cod Army started well, seeking consecutive wins for the first time since August when a three game start of the season winning run was ended by Chesterfield in a goalless draw at Highbury. Hird had to nick the ball off McAlinden’s toes after an error by Ryan. Jones had to be helped off the park with an ankle injury, Ariyibi came on and Clucas moved back to left-back. McLaughlin was booked for a foul on Roberts but he pulled up play after the fouled man had played a great ball through to Banks; the free-kick was cleared by Chicksen. Roberts, Fleetwood’s skipper, was booked for a foul on Banks and Chesterfield’s Roberts over-hit the cross in the second phase from the free-kick. Darikwa’s shot was deflected wide after a good Spireites move. Hughes fouled Roberts 25 yards out, centrally, Roberts hit the wall and Ariyibi had the ball pinched from his toes from the rebound. Morsy’s cross was blocked by Roberts as Spireites began to notch up the territory percentage. Clucas hit his cross out after the impressive Darikwa had started the move and Lavery had held the ball up well. Lee saved from Sarcevic after Clucas failed to put any meat on a clearance and from the break Banks burst forwards and hammered a great shot that Maxwell tipped onto the bar and it flew out for a corner that almost saw Hird get in after the keeper spilled it but the ball was eventually cleared. On 31 Spireites took the lead. Darikwa fed wide to Ariyibi and he cut inside to roll the ball to CAOLAN LAVERY who rolled a neat left footer low and in at the far post. Chesterfield scored a second on 42 minutes. Banks delivered a free-kick from the right touchline that Evatt headed firmly; Maxwell scrambled left to block but SAM HIRD scored a poachers goal from three yards to double the Spireites’ lead. Before the game re-started, Fleetwood’s Sarcevic was red carded, presumably for something he said to referee Miller. Hughes tripped Morsy left of centre, Roberts delivered and a corner resulted. Banks delivered deep and Hird’s powerful header was blocked by the foot of Maxwell on the line. Roberts was tripped by Hughes who picked up a yellow for this challenge. Banks shot from 30 yards but Maxwell, at the second time of asking, gathered. McAlinden and Ball were replaced by Proctor and Murdoch. Lavery’s shot from 15 yards was brilliantly blocked by Roberts and Darikwa just couldn’t quite bring the loose ball to heel and Fleetwood’s skipper blocked Lavery for a second time after Maxwell had misjudged a bounce but the left-footed effort from the striker lacked power. Ariyibi and Roberts combined to earn a corner, Ryan volleyed Banks’ deep ball over as Spireites camped in the visitor’s ten man territory. On 63 the contest was effectively ended. Roberts fed Ariyibi whose cut in was a thing of beauty and placed perfectly for SAM MORSY to slide home from 12 yards. 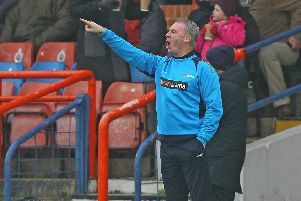 Fleetwood manager Graham Alexander was sent from the technical area after comments made following a tackle by Roberts on Hughes. Jordan was booked for a foul on Banks. Haughton massively overhit a Fleetwood free-kick from a rare sortie into Chesterfield territory and Morris soon won the visitor’s first corner of the game on 70, Darikwa and Ryan cleared. Proctor won another corner and Lee comfortably caught the delivery from Morris. Maxwell saved from Roberts after a quickly-taken free-kick following a foul on Ariyibi. Another corner came Chesterfield’s way, Banks and Morsy worked a short routine that led to Banks shooting just wide with his right foot. Harrison replaced Roberts, who was due to have played for just 60 minutes but made 75 and O’Shea came on for Lavery. They received a standing ovation from the majority of the 6497 crowd. Evans came on for Haughton for Fleetwood. A glorious Ariyibi run and cross won a corner, Banks hit high after another short routine. Harrison saw a shot saved by Maxwell when O’Shea was unmarked to his right. Ariyibi earned a corner after superb Darikwa play but Fleetwood cleared with ease. Harrison hit high after battling play from Morsy as Spireites looked likely to grab another. O’Shea hit wide after Darikwa’s cross. Chesterfield: Lee; Darikwa, Evatt, Hird, Jones; Ryan, Morsy; Roberts, Banks, Clucas; Lavery. Subs: Chapman, Humphreys, Raglan, Harrison, O’Shea, Dieseruvwe, Ariyibi. Fleetwood: Maxwell, McLaughlin, Roberts, Jordan, Chicksen, Sarcevic, Haughton, Hughes, Morris, Ball, McAlinden. Subs: Springthorpe, Murdoch, Pond, Evans, Dobbie, Proctor, Hunter. * Spireites U18’s went into their game at home to Hull City this morning level on points at the top of the North East Youth Alliance table with Bradford City. A last minute winner from Derek Daly added to goals from Mason Coy and Jake Beesley (pen) in a 3-2 win to register their ninth straight win.